Today, the Senate passed HB 1495, sending the bill to conference committee where legislators will negotiate bill changes between Senate- and the House-passed versions. As this article in the Indiana Lawyer describes, this bill aims to provide greater transparency and modest guardrails to land contracts for homeownership. While not new, these contracts have exploded in number, particularly in Indiana where communities were hit hard by the foreclosure crisis. 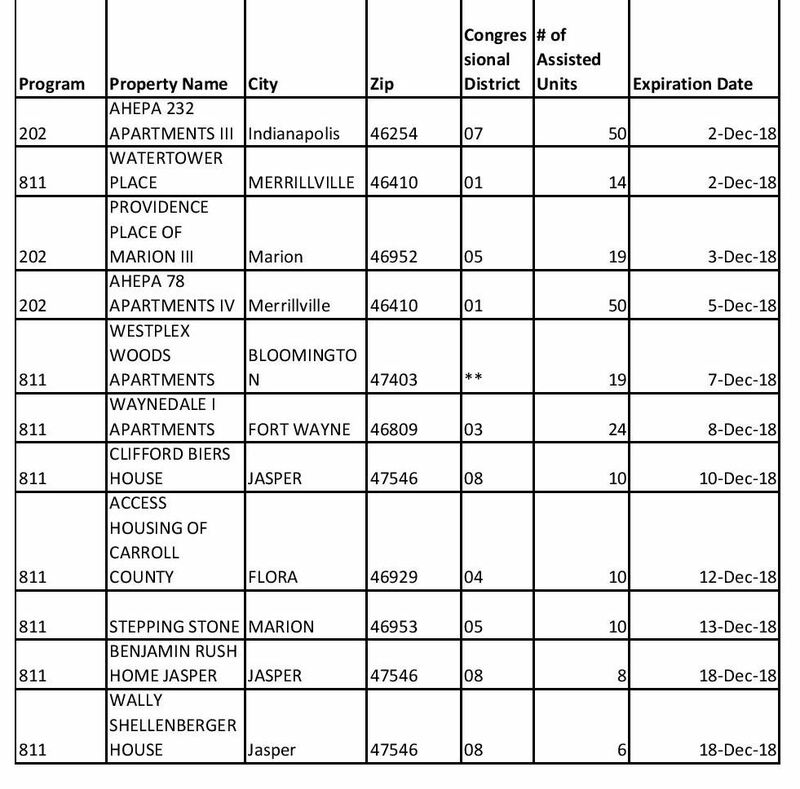 Communities with thousands of vacant homes circulating on tax sales have been purchased as investment properties, but many have also been purchased by speculators, acquiring numerous homes with low values and severe habitability issues to sell to aspiring homeowners on contract at inflated prices. In these transactions, borrowers enter into agreements with sellers who transfer the title at the end of the mortgage, rather than the beginning as you would in traditional mortgages. While this can be a viable alternative homeownership model, without any clarity in state law in how to treat them, we have unfortunately seen large scale sellers churning borrowers in and out of properties who lose all of their investments along the way. Regularly, these borrowers invest thousands in repairs only to be evicted when they are underwater, unable to keep up with repairs, balloon payments, fees, etc. and they lose all of their equity invested in these properties. That is because land contracts shift all the burdens and obligations of homeownership to the buyers with none of the rights or protections of homeownership. This transaction has fallen into a no man’s land of policy, with court opinions differing on whether or not it’s a rental contract which would have some habitability standards or a true lending contract. HB 1495 does not in any way attempt to prevent people from offering or signing these homeownership arrangements, only to provide needed clarity for all parties. In recognition that some individuals offer these contracts informally and not as their primary business, the provisions only apply to those who are regularly engaged in the business of selling land contracts and have four or more outstanding land contracts at a given time. It does not require a standardized contract, but instead would have the Attorney General publish the necessary contract components or the contract can be considered voidable. This bill would require disclosure of basic information about the property and loan terms, such as the annual percentage rate of the contract, existing liens on the property, whether or not seller or buyer will be paying real estate taxes, for instance that provide clarity for the borrower and the seller. Rather than calling for a full inspection that would be required for a traditional mortgage, the bill would have these contracts include an appraisal within the previous year to allow borrowers to know some critical information about the property without the full inspection process. The legislation is authored by Representative Vanessa Summers, co-authored by Representatives Clere, Fleming, Woody Burton and sponsored by Senators Bohacek, J.D. Ford, and Breaux. Stay tuned to this blog for updates on bill negotiations and advocacy steps you can take in support of this measure! For more information, contact Kathleen Lara, at klara@prosperityindiana.org. Thank you so very much for speaking up in support of Hoosier consumers and communities! Your voices were heard and SB 613 has died. 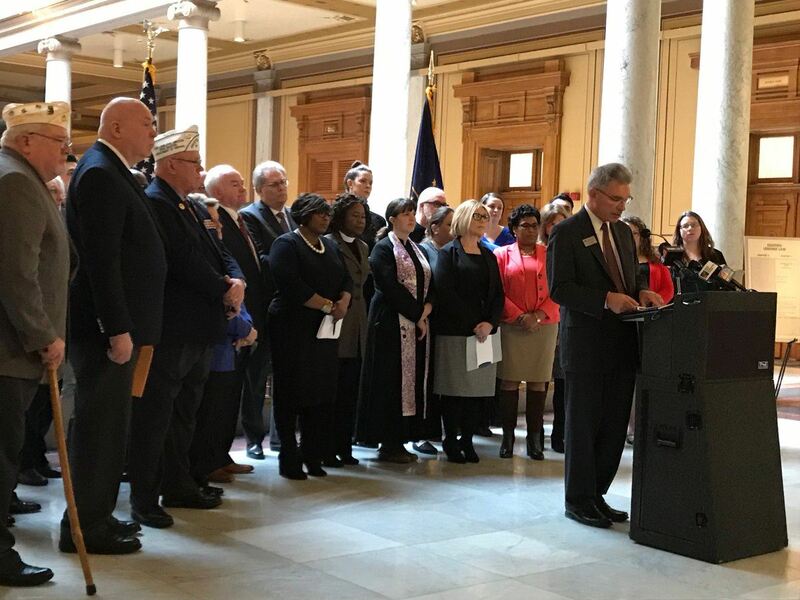 Due in large part to your outreach, testimony, meetings, calls and emails, lawmakers stood with a broad coalition of veterans, faith leaders, community and social service organizations by choosing not to call SB 613 to the floor on the third reading deadline, killing the bill. Please join us in thanking legislators who opposed this measure throughout session. We look forward to working with lawmakers to discuss reforms to high-cost loan products that exploit Hoosiers facing housing and financial hardship, as well as ways to foster sustainable alternatives. Would have kept the current payday loan product and allowed the same lenders to make 6-9 month installment loans of up to $1500 to even lower-income borrowers at 167% APR, taking access to bank accounts directly to collect monthly payments. Would have authorized a brand a new “Chapter 8” product at 72% interest plus the pre-paid finance charge, for $3000 up to 36 months with no limits on how many times the loan could be renewed or how many loans someone can have, a model we have seen is problematic in other states. And it would have increased costs across the board for conventional loans, like car loans, by increasing the max interest rate from 25% to 36% for loans of ANY SIZE and doubling the pre-paid finance charge allowed (from $50 to $100). A recent report update from the National Low Income Housing Coalition illustrates the critical need for affordable housing in Indiana. 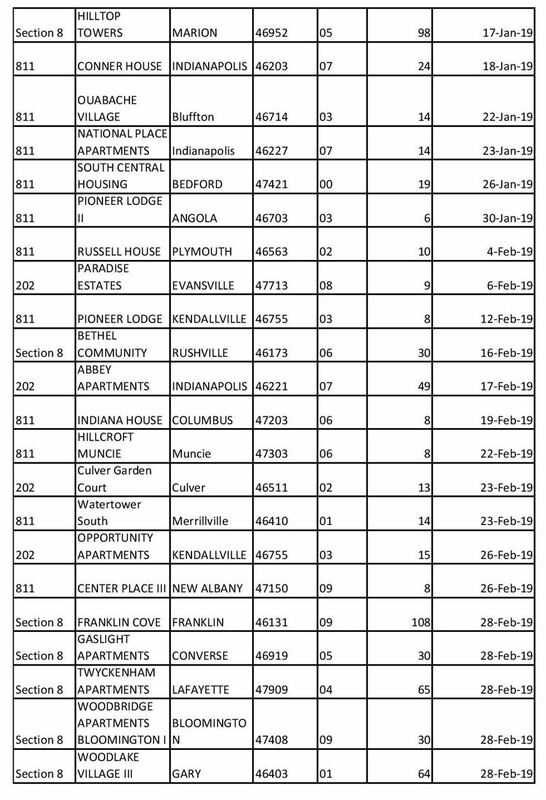 NLIHC researchers found that there is a 134,485-unit shortage of affordable, available rental housing for the 212,377 extremely low-income (ELI) renter Hoosier households. Households that are severely cost=burdened and are spending more than half of their income on housing are bearing the brunt of this crisis, and are more likely than other renters to forgo healthy foods and healthcare in an effort to pay for rent. Additionally, they are more likely to experience evictions. 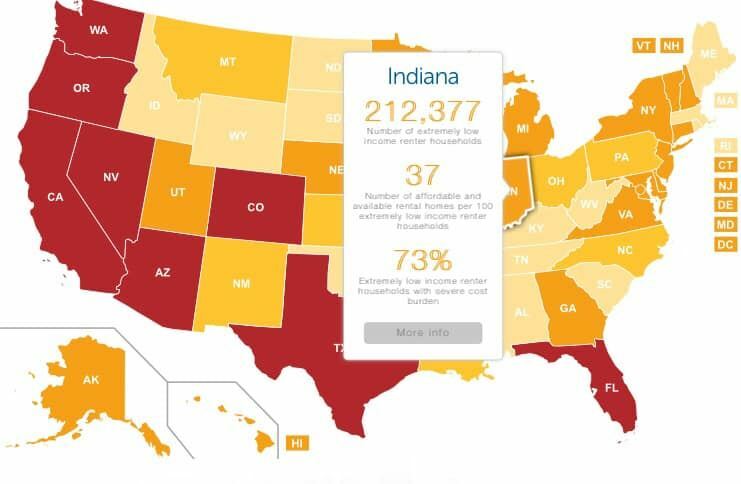 Indiana currently has one of the highest eviction rates in the nation. To view the entire Indiana state profile, click here. Advocates stood in unity to discuss the devastating consequences SB 613 would have for consumers and communities. They implored House leaders to reject this piece of harmful legislation. If passed, SB 613 would rewrite the definition of criminal loansharking and open the door for high-cost lending in Indiana by permitting larger, longer-term loan products outside of the current 72 percent cap. It would also increase the allowable cost on various consumer loans, including auto and installment loans. Click here to view a recorded live stream of the press conference and please contact your House Representative to urge him/her to oppose this bill! 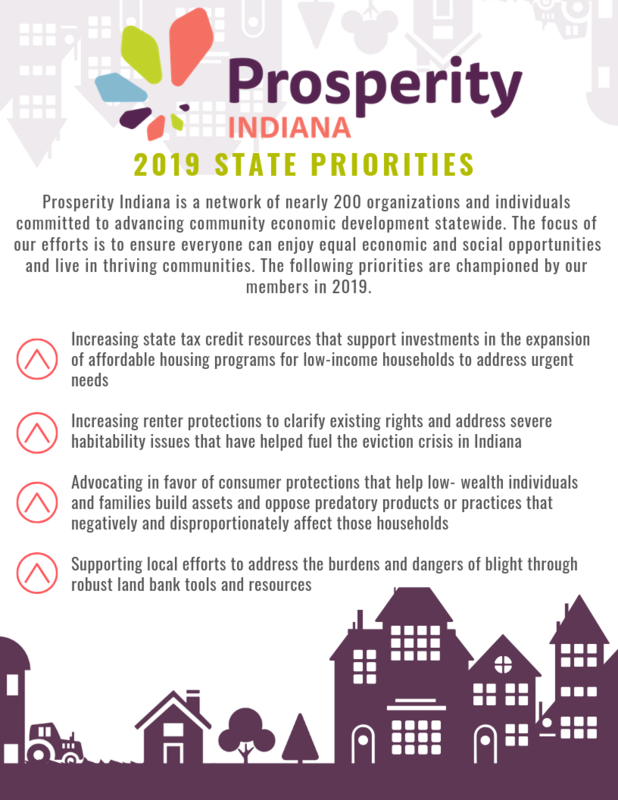 With work at the Statehouse well underway early in this long budget session, Prosperity Indiana is working to advance key member priorities, as outlined in our in our 2019 State Policy Priorities. Our network is pushing for ambitious agenda and we hope our members will register to attend our Statehouse Day on Tuesday, January 29, as we urge their lawmakers to take action on critical community development legislation. Prosperity Indiana will set up all legislator meetings for members and provide you with key talking points to make the process as simple as possible. Please review the key bills and updates highlighted below to help us move these priorities forward! We anticipate this bill will be heard in the Senate Insurance and Financial Institutions Committee next Wednesday, January 23, so please help us stop the debt trap in the Hoosier State by signing on in support of the measure. Click here to sign our letter. We are still combing through final bill lists that are still updating as I type to review measures we will advocate for or against on behalf of our members in this legislative session. Stay posted to our policy blog as we will post our bill tracker lists and details by the end of the week! As the longest government shutdown in U.S. history continues, more than 1,500 units of federally assisted housing supporting low-income seniors, people with disabilities, and families with children throughout Indiana are in jeopardy. 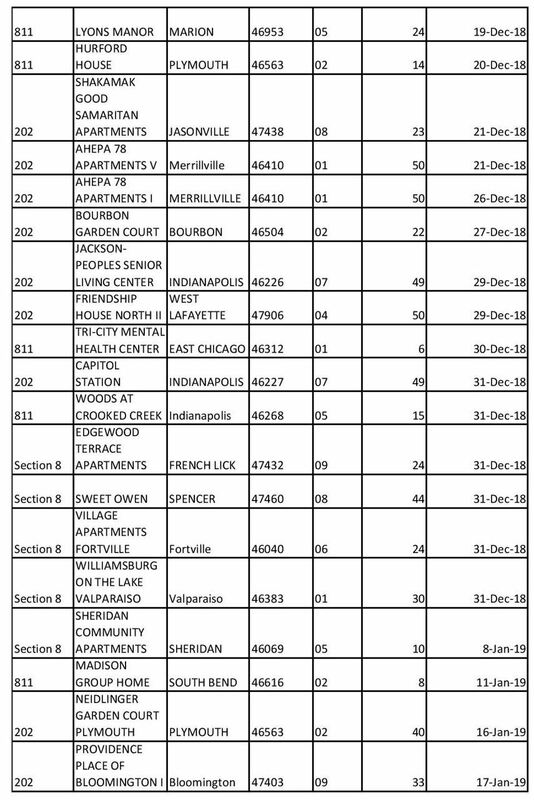 As outlined in the chart below, Prosperity Indiana has noted the 1,578 units of Project-Based Rental Assistance (PBRA) contracts that expired in December or stand to expire this month or next as the Department of Housing and Urban Development (HUD) is unable to renew them and is scrambling to fund rental assistance in the short-term without an end in sight to the federal shutdown. National advocates had previously received word from HUD that the agency had the budget authority to renew PBRA contracts through January. As a Jan. 6 Washington Post article revealed, however, that was not the case. The article quotes HUD spokesman Jerome Brown as saying that “[HUD] budget and contract staff are ‘scouring for money’ to figure out how to fund the contracts on an interim basis.” The piece outlined how 1,500 landlords received letters from the agency on January 4 in order to try and prevent the eviction of tenants after certain HUD officials had allegedly not realized had expired on Jan. 1. Those letters apparently outlined what activities will take place during the first 30 business days of the shutdown and how to prevent the eviction of thousands of tenants who live in homes covered by the Section 8 Project-Based Rental Assistance program or Section 202 (for the elderly) and Section 811 (for people with disabilities) programs. According to the National Housing Trust, HUD shared that 1,150 contracts were not renewed in December affecting approximately 70,000-85,000 low-income households. Additionally, HUD has indicated that will be unable to renew 500 contracts that expire in January, affecting another 30,000-40,000 low-income households. While HUD has expressed it is working within currently obligated funds at its disposal to cover most rental assistance payments, but if the shutdown continues, 550 more contracts are set to expire in February without HUD in a position to renew these contracts or obligate funds. HUD has indicated that Section 202 owners are expected to rely on their reserves, but advocates have concerns that budget reserves are not sufficient to meet the rental payments. HUD has also stated it plans to use funds carried over from prior years to fund these contracts for December and January, but beyond that, the agency may have to figure out a way to fund these contracts on a short-term basis. In rural housing, the USDA shutdown plan indicates that direct loan programs will not issue any additional funds, including Section 504, 514, and 502. Further, the guidance noted that banks are unlikely to close on these loans until the government shutdown ends, delaying homeownership. At present, it is not clear if USDA will continue paying rental assistance or vouchers for low- and very low-income tenants. Click here for the NLIHC breakdown of the shutdown’s impact on major housing programs. 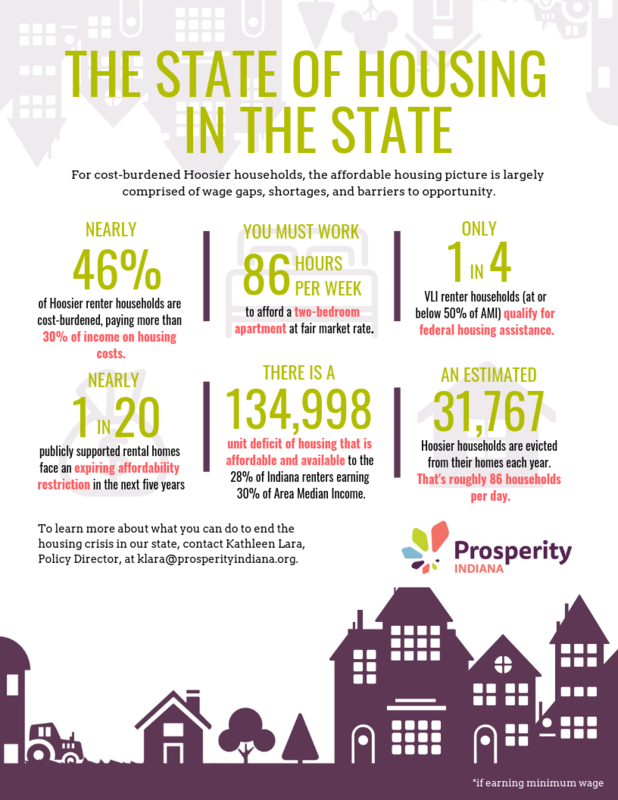 Prosperity Indiana is urging Congress to pass clean FY19 Transportation Housing and Urban Development and U.S. Department of Agriculture budgets so that thousands of extremely low-income families, seniors and the disabled are not denied critically needed housing assistance. Short-term renewals are destabilizing for private owners of PBRA properties. They limit the owners’ ability to supportive services to their tenants, delay property rehabilitation, and could potentially increase rent burdens on fixed-income populations. The average income of a household receiving PBRA is less than $12,000 and 56 percent of these households have someone who is elderly or someone with a disability, so they can certainly not afford to shoulder this burden imposed by the shutdown. HUD has shared that owners experiencing delays in payments can request access to replacement reserves, but should not do so without approval. Those requests should be directed to the Director of the Multifamily Hub or Satellite office, all of whom should be working as essential employees. If Congress fails to pass additional funding measures by December 21, the federal government will be forced to shut down. As we have discussed in earlier blogs, Congress has failed to pass numerous full-year funding bills for FY19 (including those for Transportation-HUD and USDA) and those programs have been operating under short-term stopgap measures (continuing resolutions, or CRs). The current CR expires in mere days and current negotiations are mired in border security funding debates. Some speculation has begun to filter out that lawmakers are considering many approaches to address the impasse. The most promising for our member interests is a proposal to have Congress pass most of the remaining bills for the spending year and extend the CR for the controversial Homeland Security bill. Another option, that seems like a very approach at this point would be to pass another short-term measure to keep the federal government open into the new year. One last approach that has been floated is passing a year-long CR through September 30, 2019, for all the outstanding spending bills. That approach would be a significant setback. For FY19, HUD needs approximately $1.3 billion and USDA needs at least $10 million more than FY18 appropriations to maintain current program levels and renew existing housing assistance contracts. FY19 THUD and USDA bills included funding increases to address urgent affordable housing and community development needs. Prosperity Indiana is urging our state's delegation to enact full FY19 spending bills for HUD and USDA. Join us in lifting your voice by calling your lawmakers today! To find your representative and their phone number, click here and enter your zip code in the "Find Officials" box!